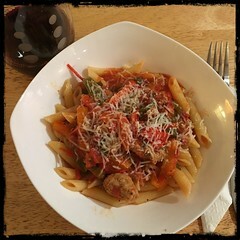 The inspiration for this recipe was obviously sausage and peppers, the classic combination of the sweet peppers and fennel sausages. Instead of sausages we often use freshly ground pork and spice it as if we were making sausages. The pancetta adds random savory bursts which help make this wondrously delicious. 1. If you’re using Italian-style fennel sausages, cut into 1/2-inch pieces, if using ground pork, mix with ingredients listed above. 2. In a medium sized dutch oven, heat 2-3 tbsp olive oil and fry the pancetta. 3. When the pancetta is browned toss in the onions, garlic and optional hot pepper flakes. 4. As the onions begin to show transparency and garlic softens toss in the cut up sausages or use the pork mixture to make small, rough meatballs. Mix well and let cook for 5-10 minutes, mixing often. 5. When the pork is cooked to your liking, you can toss in the peppers. Cover the pot and let cook, mixing occasionally. 6. When the peppers begin to soften add 1 cup of white wine (Pinot Grigio). 7. Let cook for about 2 minutes before adding a cup of chicken stock and the bay leaves, let return to a boil. 8. After about 5-minutes add the hand-crushed plum tomatoes and let return to a boil once again. Allow the sauce to simmer for about 10-minutes or so. 9. While the sauce is bubbling add basil, salt and pepper. 10. let cook for 5-minutes or so before adding the lemon juice. Taste and add salt and pepper to taste (if needed). 11. Cook pasta and let sauce continue to cook as well. 12. Serve the grated Pecorino Romano cheese!